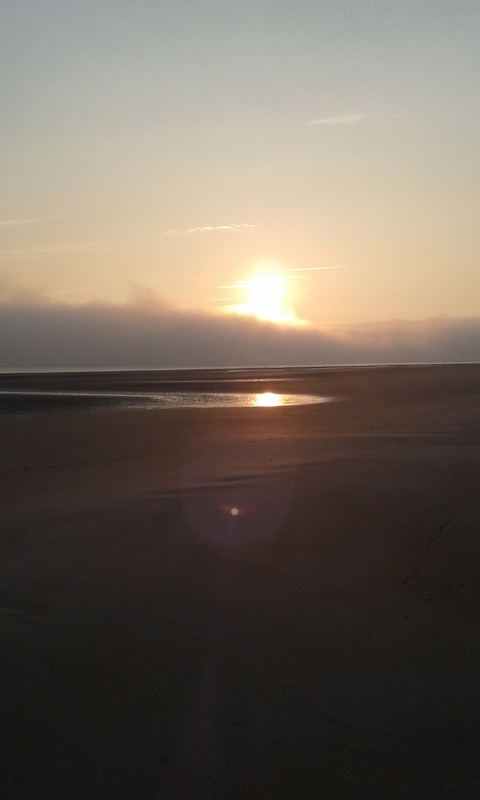 A brief post, just to say how magnificent this morning’s dawn came up; out of the mist which clad the vales but miraculously evaporated as its power amplified, the sun greeted us as we ran towards it, full of hope. Peace and beauty, for which we all are grateful and by which we all are most blessed. You never know what is coming, do you? 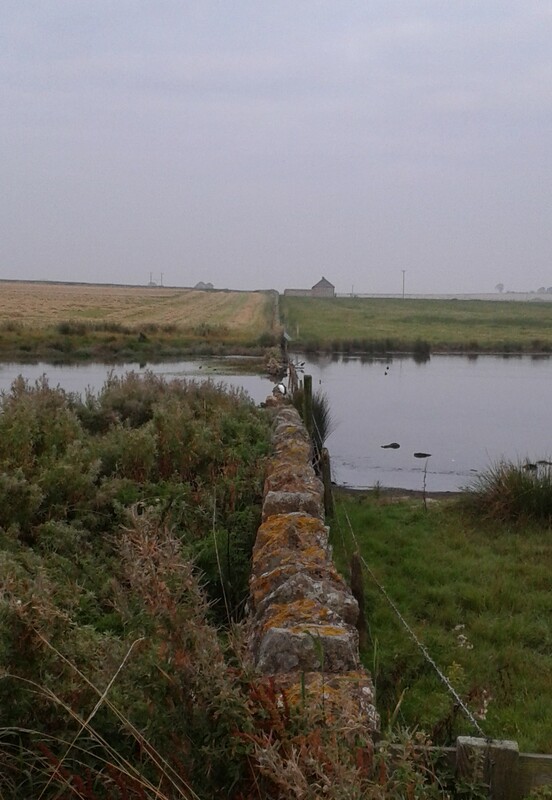 Yesterday we were thrilled to see a Little Egret fishing on the mere, a vision all in white, posted upon the stone wall, inspecting the pool for a snack. Unwilling to be pictured other than at such a distance as to be but a dot on the landscape, he flew away as Kemo Sabe turned the camera off, our dismay at missing a shot of him passing put down to experience, as disappointments are. Then, near the whelkery, as we trundled along the beach, we recognised his unmistakable form peering into a rock pool. Pictures cannot make up for the glorious reality of such a surprise as seeing this terrific type of heron on our little patch. What is it about birds of a certain height and demeanour, or dogs of a particular pondering nature, with so many thoughts about holding on to see what life has in store for us, just round the corner? It is Jeoffry’s thirteenth birthday next week, and then it will be mine. Three years of pondering: heigh ho. I like this time of the year, when the crowds diminish and our area regains some of its characteristic emptiness and peace. The sea this morning was gentle and still, high tide nipping at our toes as we dodged the seaweed and the temptation of eating it. The end of summer is a fitting time to celebrate one of our most significant saints, perhaps the most important man in the history of Northumberland and, when it comes to the history of our country, one of its most unlikely but profound influences. For it was St Aidan who, as a man of God and an ascetic in a time of self-servers, brought Christianity to the people of the north, and from here a different view of life spread out across the land. The beautiful shrine in this picture was erected over the spot where Aidan, Irish missionary to the English, declined and then died in 651. Bamburgh church, where you will find it a stone’s throw from the high altar, is rare if not unique in housing the very spot where its patron saint departed his life, under the tent which was thrown over him where he lay exhausted by a life lived for others, leaning against the beam which remains within the church. This time last year the Archbishop of York inaugurated the new shrine which beams with lovely candlelight reflecting the great saint’s continuing presence in our midst. Yesterday was St Aidan’s feast day so, after a liturgy in which his work and legacy were recalled and pondered on, the congregation gathered around it to hear Bishop Frank White read St Bede’s narrative of how the dear man died. In life, Aidan knew both rags and riches, identifying with the needs of the poor by meeting them on foot on his perambulations throughout what was then the kingdom of Northumbria. There cannot be a pathway around here he has not walked before us; indeed, his spirit on the beach is very strong, his footsteps still visible to those who look for them. Kindness, generosity and compassion guided St Aidan’s telling of the Scriptures, whose loving message he knew to be so vital if people were to move forward together into a future free from barbarity and in-fighting. These were messy times and odd bedfellows found themselves on the same side. Aidan’s patron, King Oswald, had himself been supported by pagan tribes when at Heavenfield near Hadrian’s Wall he took on Cadwallon of Gwynedd, a British leader of Christian descent who had allied himself with the pagan Saxon, Penda of Mercia, and threatened the independence and values of Northumbria. 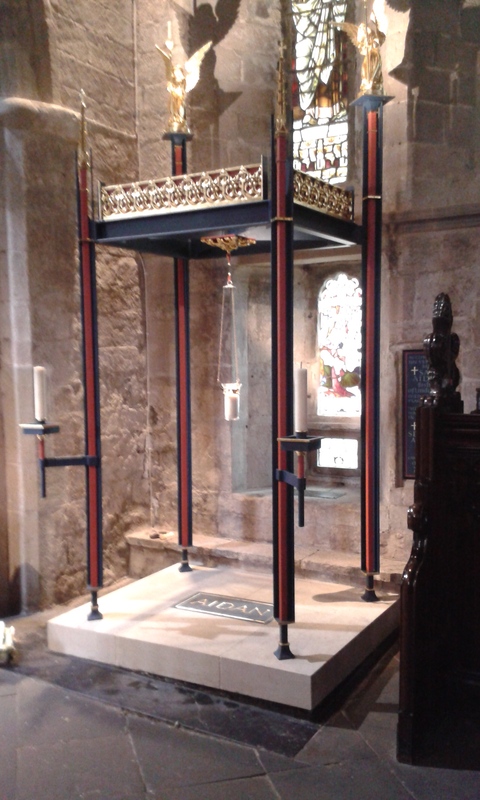 With Aidan to lead him, Oswald was able to bring unity and peace, mutual respect and freedom to live and think, governing from the mighty stronghold of Bamburgh from which, through St Aidan’s influence, the poor of this area were provided for, both in body and mind. The monastery of Lindisfarne, founded by Aidan, became a lasting legacy of teaching and learning during a golden age which endured until destroyed by Viking invasions in the eighth century. Every day when we look out across the sea we think about the little craft which brought Aidan here; the mooring place at Monk’s House, where stream and sea significantly meet, is a place I jump for joy. Bank Holiday weekend and all that it entails! Thus, the end of the holiday season approaches and we boys have reason to feel relieved; never before have we seen so many folks around and for so long, too. Our daily routines have negotiated the tides as usual but, additionally, the timings of the beach crews on warm, still days, of which there have been plenty. Weekends are the worst, visitors leaving in their wake piles of litter where it falls: blisteringly hot ‘throw-away’ barbecues – agony for dogs’ innocent paws – jettisoned tin foil, plastic bits and bobs of all kinds, balloon strings, cola bottles, broken sandals, spades, and toys, bags full of dog poo, nappies full of baby poo (yes, most disgusting of all), ice cream boxes, fish and chip cartons, crisp bags, shopping bags, biscuit wrappers, used baby wipes – on and on and on. On the afternoon walk we gather up and deposit safely whatever rubbish we come across, sometimes filling two bags and dragging bigger items from the beach and dunes. Wind-breaks are parked as and when it suits but too frequently at the point where the pathway from the dunes just meets the sand, forcing everyone else to negotiate their trenches even though it’s obvious we are not welcome, innocent and disciplined as we come. Taciturn faces, returning silence for cheery greetings whatever time of day. Aren’t you enjoying yourself, I want to ask? We might also ask the little seabirds the same question, choking and catching the detritus on their beaks and legs as they do. Then there is the matter, a serious one, of danger to life and limb. Every season several of our friends are attacked by unknown dogs, as Barnaby and Newman have been too. Using a lifetime’s experience of identifying at long distance dangerous breeds by what bird-watchers refer to as their GISS*, we have so far this year managed to steer clear of such unpredictables just in case we came off worse against passive-aggressive creatures who only see the light of day rarely and have never had the freedom of a massive beach before. Our dear Shar-Pei friend almost lost her life to a sudden and unprovoked attack from a newly re-homed rescue dog whose owners had never taken her out before, but simply let off the leash with catastrophic results. Dog owners’ ignorance and insouciance are breathtaking. If this sounds a bit cynical for a small pondering spaniel, it is what the world this summer has made me: after all, things have been terrifying, wouldn’t you agree? The Four Horsemen are stalking the world with barbarous efficiency, setting us all at odds with guns, germs and knives, hatred and despair. It takes great faith to lean hard on the good, but ‘the rest is not our business’, as someone famous once said. Looking up, I look for leaders to find the world’s way forward and hope they show the confidence dogs look for in their humans. When my little frame is borne down upon by a massive beast who has no idea how bouncy and brutal he feels, even if he only intends fun, it is very frightening, and frightening for us all. Barnaby with his massively booming single bark is always alert, always on his guard, our joint welfare his way of life. With characteristic, consummate style, he warns those who come down on us like the Assyrian (i.e. ‘like the wolf on the fold’! ), usually but not always giving the harmless ones pause. On our behalf Kemo Sabe is one step ahead of him, bringing Barnaby to heel immediately, securing him to the lead with Noggsy, taking us up into the dunes if need be, to avoid crossing the path of the wayward and uncontrolled who are traversing the beach at will as though their owners own it. The twist from colliding with a sprinting lurcher or labrador can easily result in a torn cruciate ligament but this knowledge eludes those who permit their beasts to charge around and indeed seem fearful of laying hands of restraint upon them: interesting that. ‘Exercise authority!’ I hear myself shouting, were I able to tell them. Why do the best appear to lack all conviction? This morning, as is our custom, we trundled along the beach once again, hearing the waves gently kissing the shore and greeting the few folk who were about with a gentle word. We are lucky. Ours is a peaceful, quiet life, cushioned by routines. A lovely run on which I found a perfectly formed tennis ball to add to my collection – always a treat – was followed by a lovely breakfast, with jellies and pate. Everything was as it always is: I am loved, cared for and safe in the home I love. Now we are full and resting, and I ponder further on what was running through our minds as we were trundling across the sands which have seen so much conflict in the distant past; we only have to gaze across at Lindisfarne to remember what havoc the Vikings perpetrated there and we do indeed just that, often. You do not have to look far to find a fight. Today, the 4th of August 2014, is the feast day of St Oswald, the warrior-king of Northumberland. This seventh century leader, known for his prayerfulness and generosity, defended Christian values and the independence of the north when he led his polyglot army under a Christian banner against the ambitious British leader, Cadwallon, defeating him in battle at Heavenfield, near Hexham. He fought and it was ugly, no doubt. Thus was established the ancient kingdom of Northumbria, its capital being Bamburgh, under the ramparts of which great castle we enjoy Oswald’s peace each day. Peace, care for the poor, the ministry of St Aidan and the monks of Lindisfarne – all flourished because of Oswald and the fight he’d undertaken. No saint, they say, without a past. Today is also the day on which we commemorate the United Kingdom’s declaration of war on Germany a hundred years ago, when Belgium was invaded. It is a day of enormous solemnity and thought. 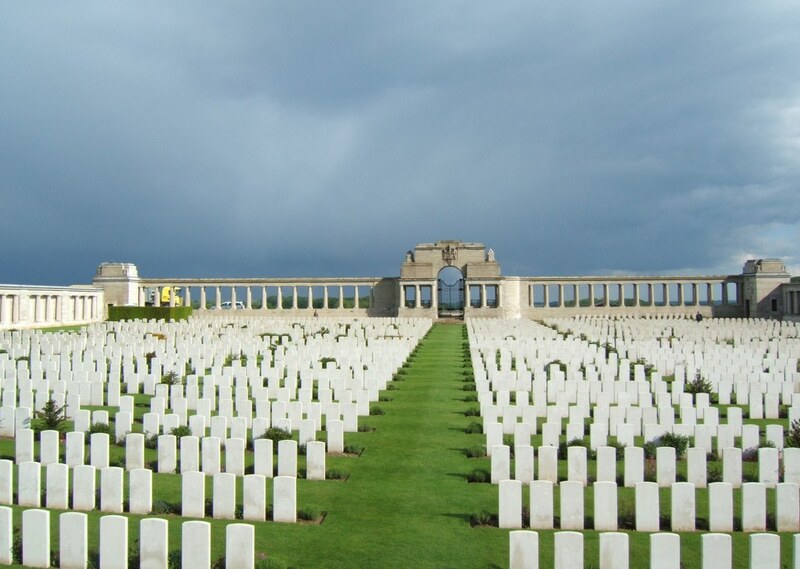 So many people were affected by that conflagration – a total of 36 million, either killed or wounded – and the lives of countless others touched by the loss of those they knew and loved. In Kemo Sabe’s own little family, great uncles on both sides brought down in their youth. Names on memorials we will never see; a grandmother’s losing her only younger brother she will have a hundred-year lifetime to mourn. Today we all can hear the prayers said and hymns being sung. As light falls, to commemorate the lamps going out a hundred years ago, households in this country have been asked to light a single flame. There are no words a humble soul can utter which would adequately express the overwhelming emotion of this terrible day, when the dogs of war (so alien to my simple self) were unleashed. No sinner, they say, without a future. And if one brown seagull should accidentally fall . . .
One of Uncle Jonny’s nicknames (and he had any number, ranging across the gamut of his funny ways, talents and naughtinesses) was The Seagull. One of his particularly loving young friends always referred to Uncle Jonny by this soubriquet, which was indirectly derived from a rather pretentious little book popular years before our dear old friend was born. Maybe for this reason, as well as for its own venerable qualities, the seagull – more properly the gull, as a pedantic bird watcher insisted – has always had a place in our hearts, standing in as our living ones do for our late lamented brother with his own inimitable kind of fun and games. It looks as though the saga of this year’s intense rearing is finally drawing to its end, with yesterday bringing the crisis in which the cherished siblings started their vertical jumping with simultaneous arm-flapping, imitating the action of a helicopter hovering, however briefly. As a result of this discombobulation, Peter ended up a little further from home than he had intended, landing on the slope of the roof, down which he slid backwards, arms outstretched, until he braced his flippery feet against the guttering, all the while facing towards the tiles, hanging on for grim death. The final indignity came when he dropped a storey, to land on top of the front bay window, where he has now been for over twenty four hours, by turns standing to attention and curled up sleeping. This charming drama was watched with engaged excitement as it initially unfolded yesterday morning by the visitors breakfasting across the road, who shouted their encouragement to poor Peter as they downed their Full English Breakfasts. It is almost impossible to see this dear creature as a ‘flying rat who should be shot’, which was a local’s denunciation of this child struggling for independence from its doting parents. They have continued attentively to feed and sit with Peter where he landed, no doubt hoping to tempt him back to their eyrie but he won’t be persuaded and he seems quite happy where he is until he gains the confidence for his first flight. While patient Paul remains in situ on the chimney breast, Mary’s helicopter routine landed her on the roof ridge, just a hop away from the place of her birth, and there she has squawked her way through the day. As I write, I have only noise to report about, but fear not: both we and the kindly neighbours have tinned mackerel ready should extra rations be needed, or should one or other of the triplets fall further. Our arms are ready! 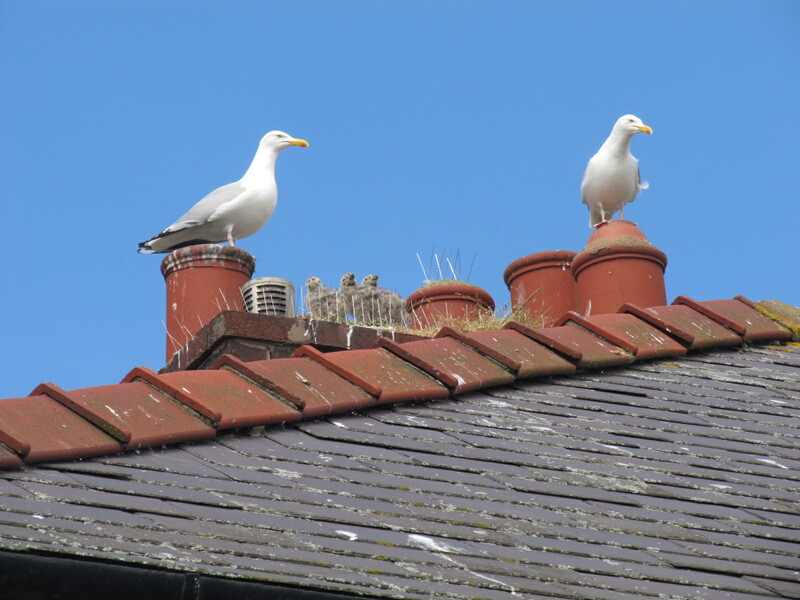 The insistent peepings from above remind us constantly of the triplets’ presence and, looking up, we can easily see how quickly our herring gull offspring are growing. Kemo Sabe has taken several rather poor photos over recent days because it’s proved terribly hard to get the three youngsters together, standing upright and looking at their best. 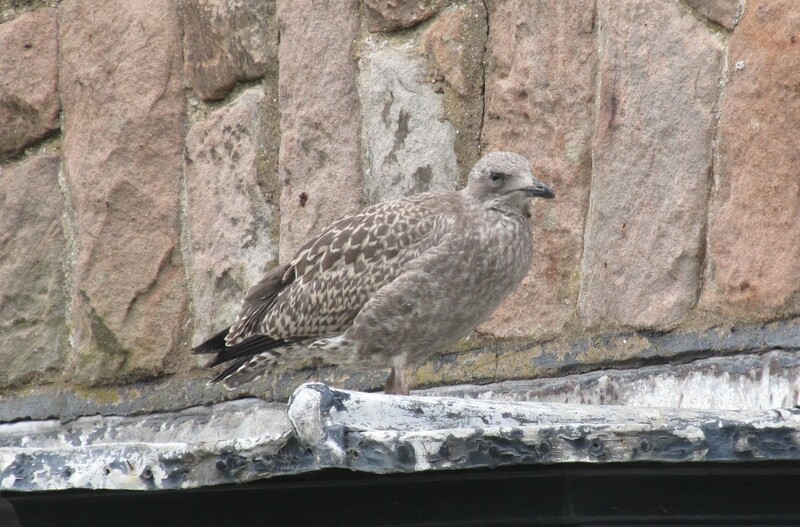 This picture was taken this morning and at least clearly shows the juvenile plumage emerging from the fluff. One of the parents is also looking charmingly smug, while sitting as ever on its favourite cowl. 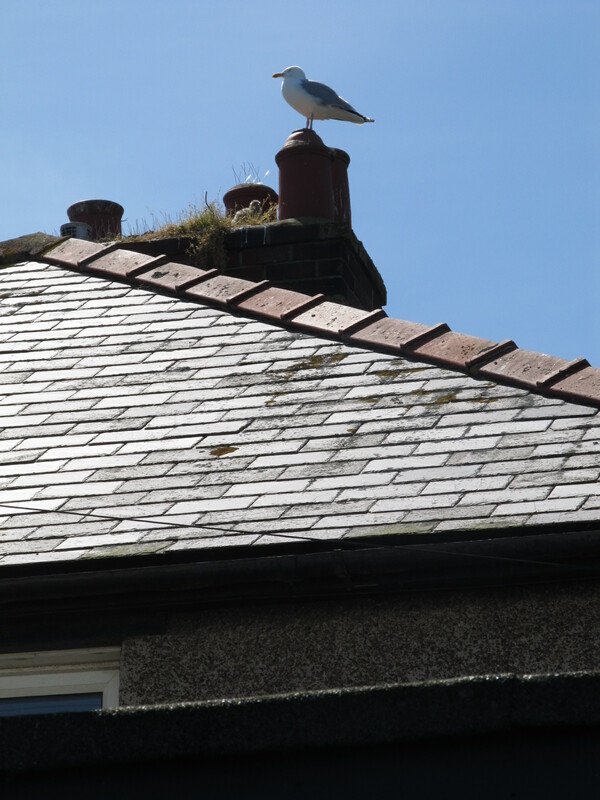 As we watched the gulls this morning, the swallows were dipping in and out of our vision as they wheeled about the chimney stacks and down around the rooftops. Above our own house the jackdaws squawked and flew about merrily, discussing their immediate plans as they did. The joy expressed by our much-loved and abundant bird-life was, however, lacking first thing this morning on the occasions we greeted solitary walkers on the beach but without getting any response whatsoever. This kind of thing isn’t uncommon but is baffling, particularly to a special spaniel with a friendly turn of ankle. I wish the dour ones all the best and run on, pondering. Despite the weather forecast’s prediction, our little coast was this morning bathed in hot sun, and the waters were calm and high: glorious. When the sand is soft, it’s like wading through treacle! Perhaps today I am Beau Geste! Behold! 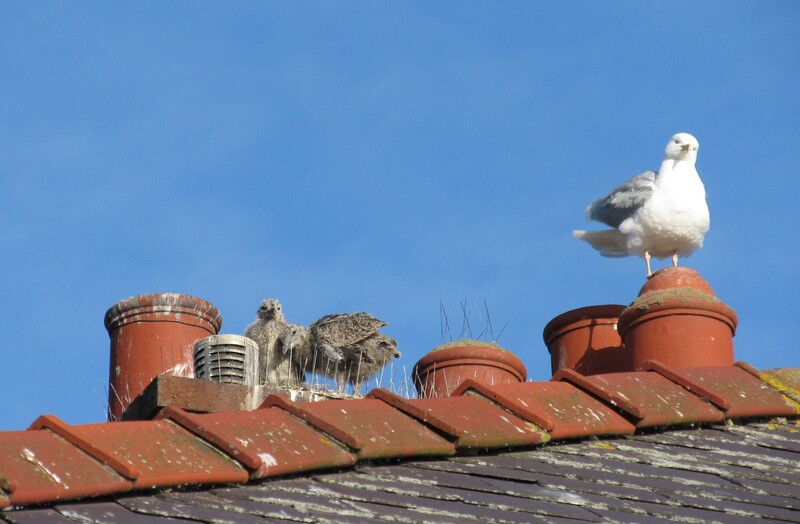 Amongst the blanched bits of vegetation up on next door’s roof you can see that our beloved herring gulls have once again had a successful breeding season, this year producing no less than three delightful chicks. Things were definitely stacked against them this summer, as Works All Hours next door had at last found the time to stick up the bird spikes which had been gathering moss for years on the recycling bin by the garage, though the snails got the better of the cardboard box they sat in. 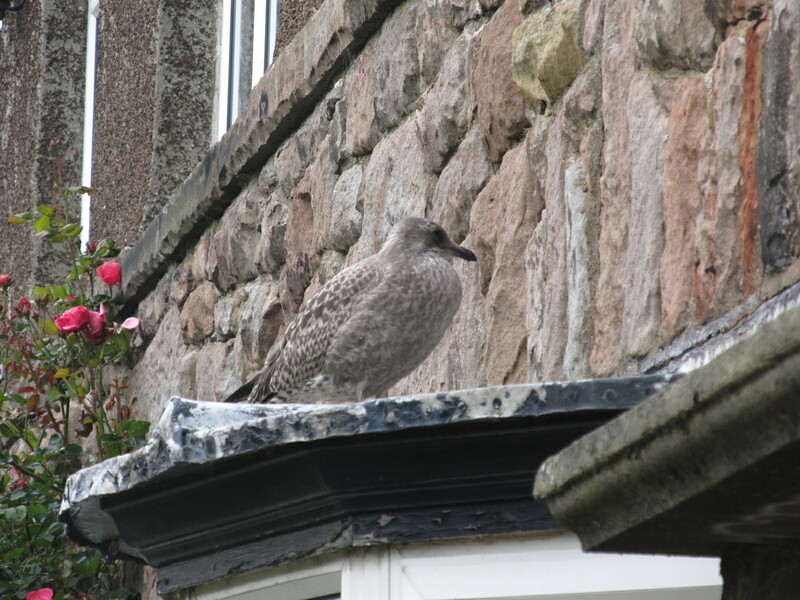 I wrote last year about what doting parents our gulls are, spending months feeding and reassuring the youngsters long after they have fledged. The first chick this couple introduced to us was Nigel, whose first flap into the air landed him in our back garden, which gained him a (temporary) limp. He proved so dependent on his long-suffering parents that he hung around the nest-site for months, demanding food well into the autumn and returning regularly long after that. We inferred that he must have had to re-sit the examinations our Northumbrian seagulls must pass in order to qualify for independence (titles such as Shoreline, Scavenging for Chips, Flying as Far North as Berwick, etc.) a number of times. We loved Nigel: he was Special Needs, requiring not only weeks and weeks of parental input but such interventions as having the National Trust man remove him from our garden to the flat roof beneath his parents’ nest so that Works All Hours’s kindly, animal-doting wife could feed him tinned mackerel and, we all hoped, stop him jumping into any more trouble. After Nigel, two sets of twins came along: Charlie and Lola and then last year, George and Peppa. When the successful parents returned to the chimney to start this year’s parenting marathon they were dismayed to find their spot bristling with deterrents. We were all worried, and sad to be denied the daily fun of watching the creatures grow under their wonderful parents’ care. But we soon found one of the spikey strips jettisoned on our drive, cast down contemptuously by proud creatures determined to make the site work, no matter what. Moreover, grass soon began to grow, as if nature were colluding to make things more comfortable now it had something to latch on to. We became aware that eggs had not only been laid but hatched when the mottled chicks’ peeping chatter pierced the summer afternoon last week. That there are three little souls is so thrilling. We have never doubted that this breeding pair means business; so healthy and organised are they that an extra babe is taken in their stride. 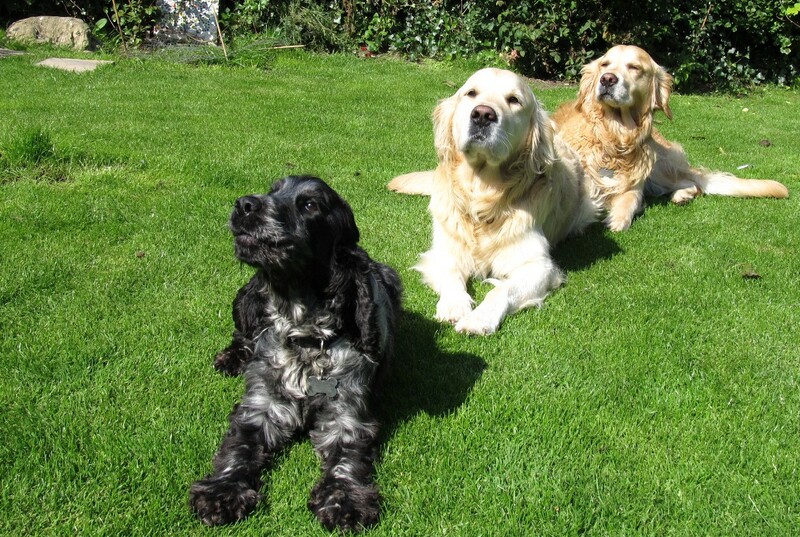 So the Dickens Dogs introduce you to Peter, Paul and Mary. I shall keep you informed of how things go up there, on the roof.